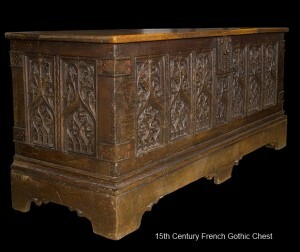 I’ve always been fascinated with the carving examples of “Gothic Tracery”, and the intricate and delicate feel to them. After taking the “By hand and by eye” class with Jim Tolpin, and the ideas I picked up behind laying out things with a compass, I was somewhat inspired to do a little research. However, there is VERY little out there for the aspiring carver to pick up and learn from. Gothic Carving example from a 15th Century French Chest. 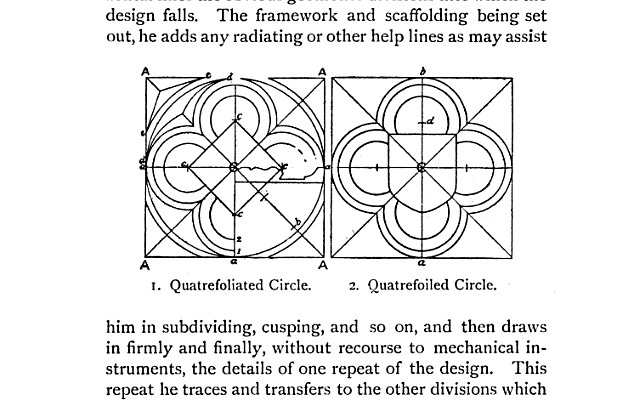 I did finally find a book on Google Books that was of some help: Practical wood-carving: a book for the student, carver, teacher, designer, and architect by Eleanor Rowe. 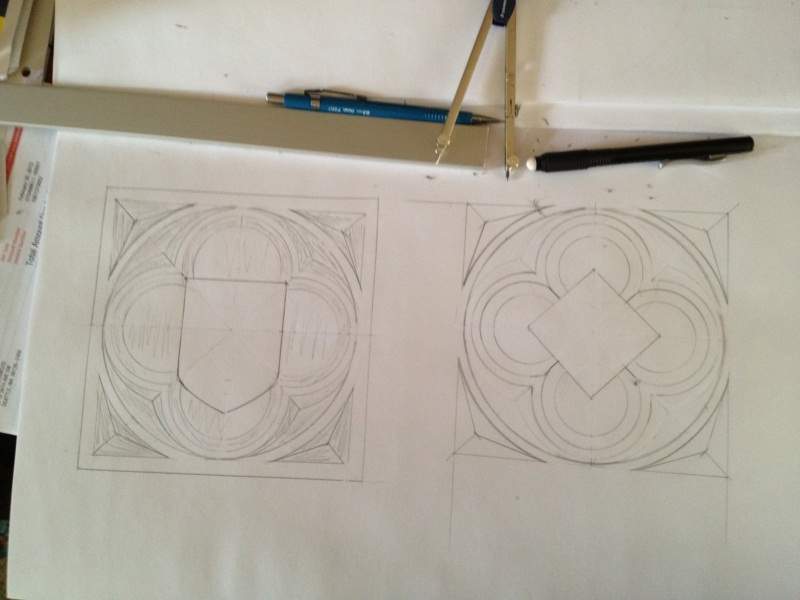 She touches on Gothic Tracery in some what obscure language in the book, and I sat down today to try and figure out how to lay this stuff out. 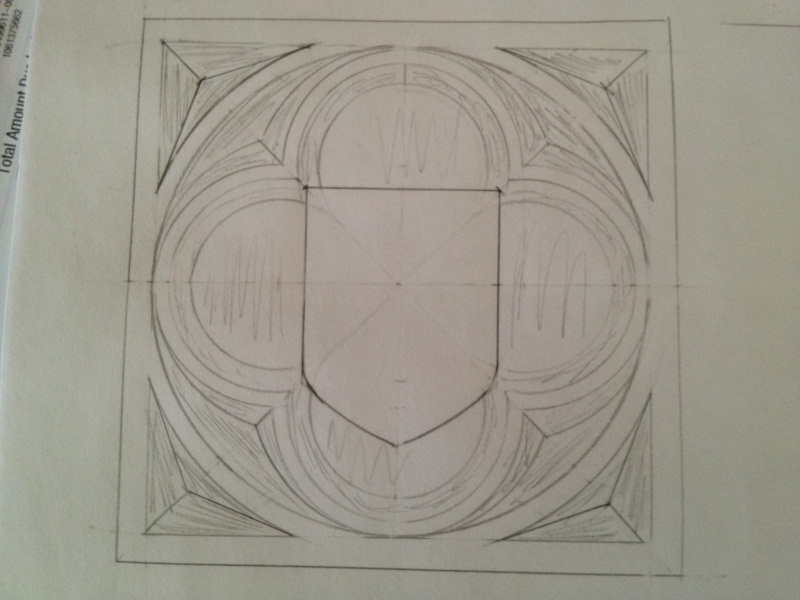 I learned a few things, and actually feel pretty good about laying out this basic “quatrefoil”. No measuring happened, just arcs and lines. 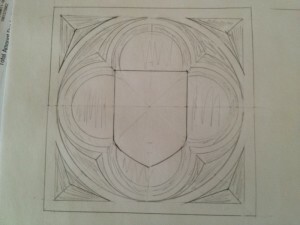 It’s a starting point, and I’m going to try and get some time down in the garage to lay this out, and try some carving. This one was my favorite of the two, where I used a midpoint on the radius to base the circular lobes on. I know that makes no sense, but putting compass to paper really helped figure this stuff out in my head. The layout was fairly simple once I got started, it’s just complex looking to start out doing. Let’s see what happens when the chisel hits the wood. The layout looks great Badger! 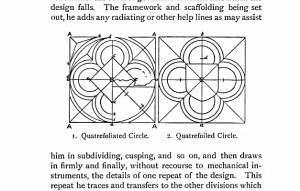 Thank for the link to the book – I want to try carving this sort of design myself. I’m not a wood carver, and my interest in woodworking comes from little odd projects around the house. Gothic tracery fascinates me with its simple tools and dimensions, yet complex beauty. I wish more people had an appreciation for this kind of artistic skill. Kudos for investigating and trying to learn this stuff.